This recipe is kind of my own invention. It started out as one thing and ended up as something completely different. I love it because it a whole meal in one dish (thus the word casserole, right?) I also really like that I can do most of the prep before dinner time (nap time cooking anyone?) and just stick it in the oven 30 minutes before we want to eat. The other thing I like about this (and any kind of enchilada type recipe) is that it is super easy to customize to your liking. I usually make it with chicken, but we had chicken yesterday so I am using hamburger. First step is to cook your noodles according to package directions. Funny story. I honestly have no idea what the pasta that I used is called. There is this awesome lady in our ward that gave us a bunch of her old food storage and she gave us this bag of pasta, but it wasn’t in the box anymore. But they looked neat. If anyone knows what they are, please let me know, I’m curious. 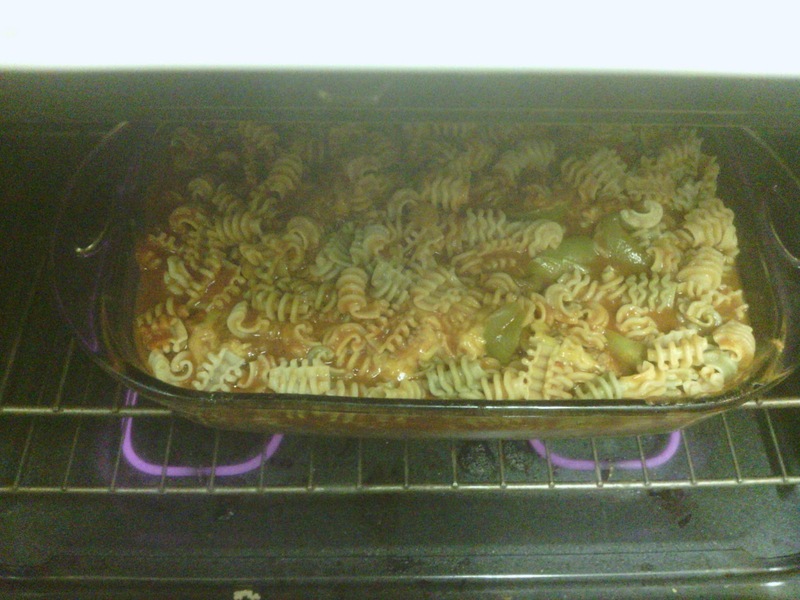 Once the noodles are done, drain them and place them in a greased casserole dish. While the pasta is cooking, cut up your green pepper and onion. I used a green pepper that I had previously cut up and froze (super good tip by the way). Saute them in olive oil until they are soft (10 minutes or so). 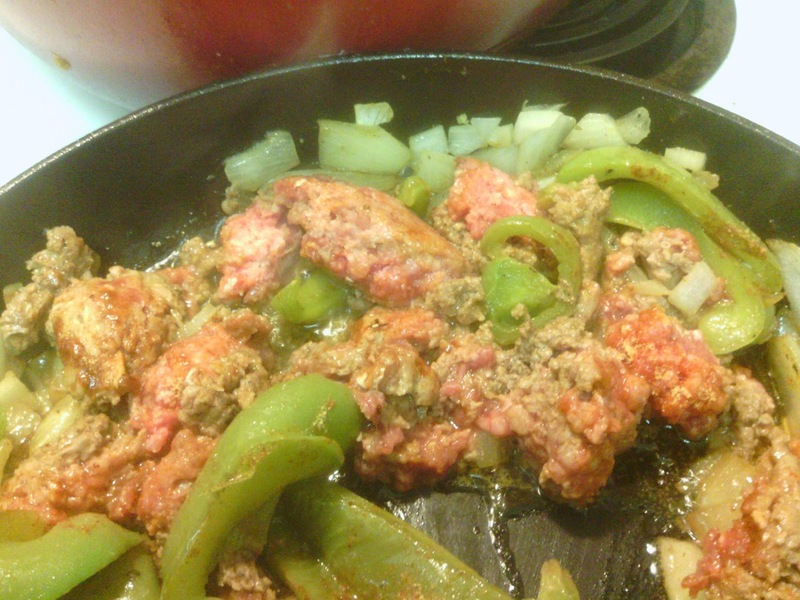 Once the green peppers and onion are soft, put the hamburger and seasoning in your pan. I am using my Lodge Color Skillet again. Cook over a medium/medium high heat until the hamburger is mostly cooked. Add 1/2 of your can of enchilada sauce, refried beans, tomato paste, and water. Cook for another 10-15 minutes. Make sure the hamburger is cooked all the way through. Pour your cooked meat mixture over your pasta. Pour the remaining enchilada sauce over the top. Add about half of your cheese and mix the contents of the pan. Cook for 20 minutes. 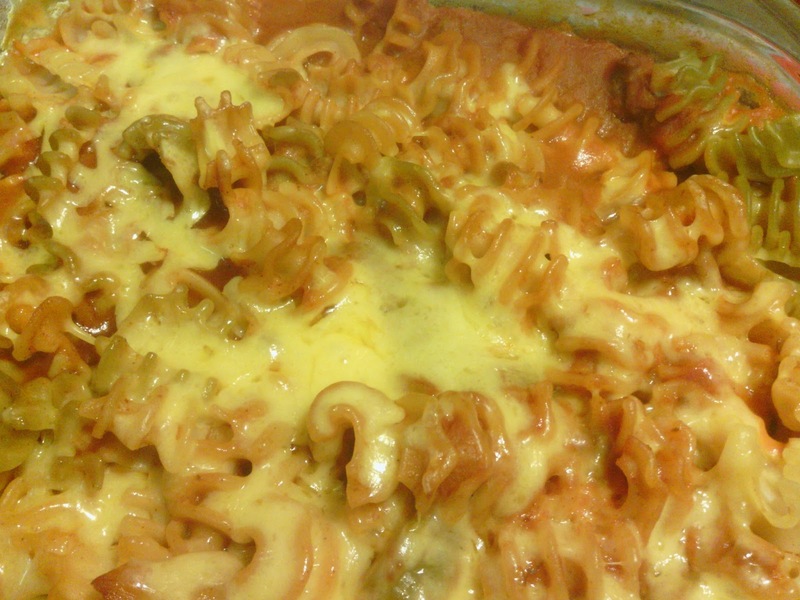 Put the remaining cheese on it and cook another 5 minutes, until the top cheese is melted. I like to eat this dish with avocados and salsa and sour cream mixed in. And for the record, I think the mouse is now living in our attic. Or maybe it’s a cat. I’m not sure which. 1145 Commentshttp%3A%2F%2Fwww.amouseinmykitchen.com%2F2013%2F01%2Frecipe-7-enchilada-casserole.htmlRecipe+%237%3A+Enchilada+Casserole2013-01-22+06%3A36%3A00Markellhttp%3A%2F%2Famouseinmykitchen.com%2Frecipe-7-enchilada-casserole%2F so far. Feel free to join this conversation. It does look like that in these pictures, but it’s not. If you look close on that third picture, you see that the spirals on these noodles aren’t corkscrew. They are just rings, but they actually don’t go all the way around, there is a break in them if that makes sense.